Router - a device designed for connection of two or more computers or other network devices to internet or other networks. To be more simple - router allows you to connect up to 4 computers to internet at the same time (providing you are connected via a DSL modem, Wi-Fi device or other network device using a UTP cable leading to your office or home and ending with the RJ45 connector). 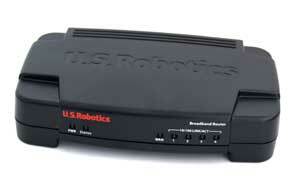 You can use the enclosed manual to set the router. however, more experienced users will manage that without the manual. This article shows the setting procedures that can be, from a larger part, applied on routers from third-party manufacturers as well. We presume you are an semi-advanced user with the knowledge of TCP/IP protocol settings. Before you connect, you need to know: 1. If the current connection uses the static configuration (manual settings of TCP/IP protocol) or automatic / dynamic (network configuration is assigned by the DHCP server). 2. If the connection requires the MAC address control. If you are using the static configuration, you have to write down the addresses for later use. If you are using the MAC address control, write down the address as well. Take the cable from the current connection and insert it into the plug labeled "WAN". Then you can plug the other computers to any of the LAN1 - LAN4 plugs. 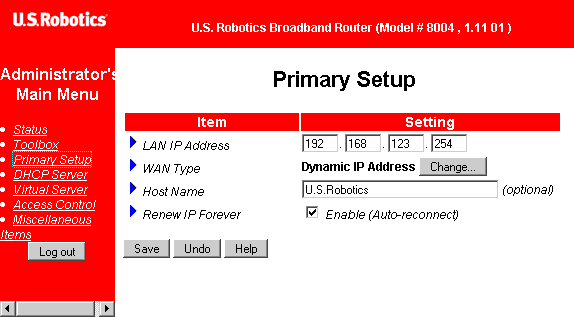 Router's default setup is to automatically assign IP address for connected devices and for WAN port settings. 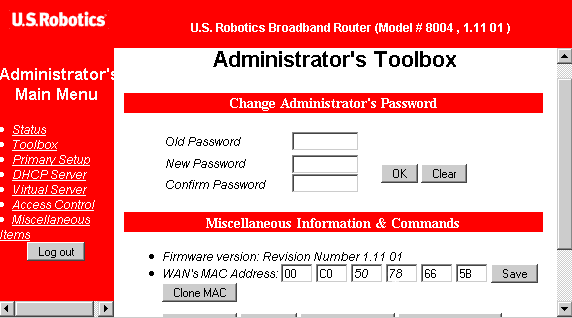 After having connected a computer to the LAN connector, the configuration is applied and you can find out the router address (Gateway address), or look in the manual(192.168.123.254). Enter the address in your internet browser. In the left part, click the Log in button. Password is not required, the default setup is an empty password (the second most frequent option is admin). If your internet connection provider assigns the automatic configuration on the basis of a certain HW address, you have to change the HW address in the router (another option is to contact your provider with the new HW address of your router). To do the change, go to the Administrator's Toolbox menu, and after entering the old HW address save the settings using the "Save" button. After you restart the router, the automatic TCP\IP configuration is applied by the provider and everything should work correctly (but pay attention to the settings of computers connected to the router). Functional physical connection, functional network card and automatic address assignment setup (obtain an IP/DNS address automatically by the DHCP server) are required. 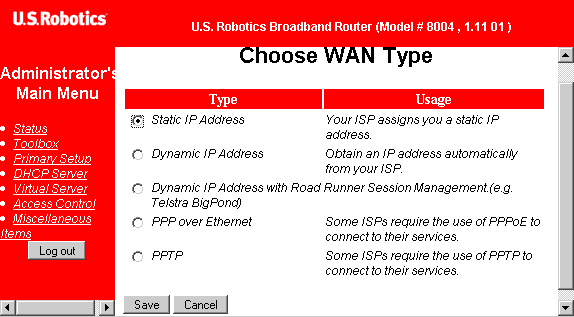 Another option is that you set up the WAN interface configuration manually. 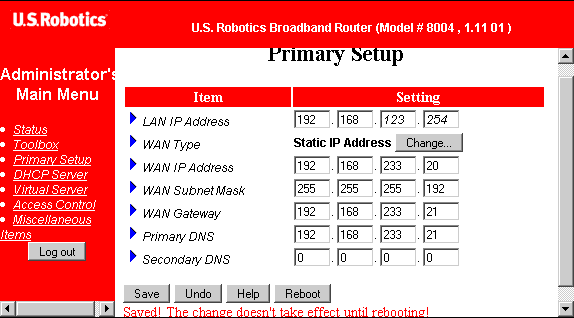 You can change the IP address of the router and the configuration of WAN in the "Primary Setup". 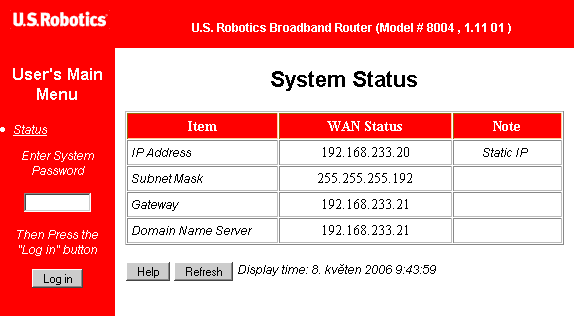 In this case, we want to change the "Configuration for WAN" - on the WAN Type line continue with the "Change" button. 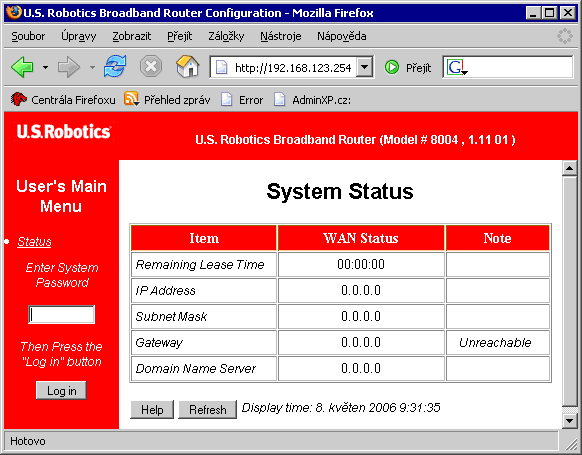 For manual configuration, choose "Static IP Address" and save using the Save button. Part of the "Primary Setup" has changed. Now you can manually fill in all important IP addresses. 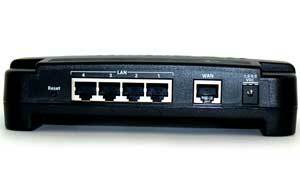 LAN IP Address (it means IP address of the router for your network) remains the same. You will get other addresses from your connection provider. After you restart the router and access the network from your internet browser, you will see that the system status has changed and it allows you to the most important data.